My daughter Payton had an awesome opportunity this weekend to take a trip to Washington DC and Richmond Virginia to run in the U.S. Army X-Country Festival at Maymont, one of the premier running festivals in the country. I have been suspiciously silent about this until now because of safety concerns for Payton, but it was difficult to keep quiet about something so exciting for her. Her team had the opportunity to run in this meet and Payton was one of those eligible to run. Earlier on in the season I never would have thought she would have been eligible, but she ended up being eligible on two levels. They took the top 7 (she is #7) and they also took the top 3 Freshmen to run in a Freshmen race. Luckily we were able to get some sponsorships to help pay for the trip and we got enough sponsorships to pay for all but $70 of the trip.... what a lifesaver! Payton left Friday morning when I dropped her off at the Airport. It was funny, she was a bit nervous, but also very excited. She has not flown since she was 5 years old. Imagine my surprise when I received a text message from her about 20 minutes after she took off...... "Thank you, thank you, thank you for letting me go.... The takeoff was Amazing!" I just got a chuckle and texted her back mentioning that she should probably not be texting from the air since she wasn't supposed to have her phone on. Friday afternoon they were able to run the course at Maymont and get a feel for what they were up against. Payton ran a 21:54 and finished 5th overall. This was not her best race or time, and I am certain she could have done better. I think the nerves of the whole trip and us not being there to cheer her on got to her. She was really upset that neither mom or I would be going to watch her run. I tried to prepare her for the race, because based on last years times I knew she would have a chance at running near the front of the pack and even possibly leading and winning it. This years winner won it with a time of 21:10 (Payton's last two meets she ran 20:59 and 21:13) This is a learning experience and next time she will know better what to expect and will do better no doubt. We are very proud of her! They drove back to Washington DC Saturday afternoon and got a little sightseeing in, but not as much as they wanted to because of rain. They got up this morning and did their long run together as a team around Washington DC, stopping along the way to do some sightseeing - how cool is that - a sightseeing run! She arrived back in Atlanta this afternoon and it was nice to welcome her home at the airport. We missed her, but was so glad she had the opportunity to go...... it is something she will never forget! That is extremely cool. Congrats to her and you must be very proud. wow! very cool :) congrats to payton! next year, she'll def have to win the whole thing. very cool experience! Awesome!! You have every right to be proud, even with that not being her best race, 5th still rocks. And that time, WOW! Congrats to Payton. Congratulations to Payton! 21:54 is a great time as a freshman on that course. 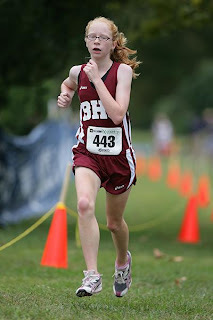 I hope her entire experience at the meet was a good one and we hope to see her back next year for another X-Country Festival at Maymont.